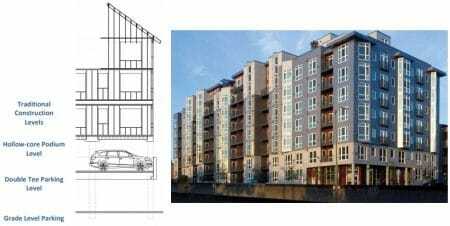 Home/ Building Technology Guide / Building / What is Podium Slab, Its Functions, Advantages and Disadvantages? Podium slabs are special type of floor system that transfers loads from a steel or wood frame structure above the slab to walls and columns below. Load bearing elements such as walls and columns of superstructure above the podium slab may not align with substructure load bearing elements below. Typically, the superstructure built from wood, metal studs or structural steel. Generally, this type of slab constructed and placed at ground level parking with 3-4 levels of conventional residential construction above. The name is derived from the “podium” that separates the two occupancies. This article presents podium slab along with its functions, advantages and disadvantages. It works as a structural floor and transfer slab for loads from the above superstructure to the walls and columns below. As a horizontal separation, podium slab works as a fire separation between different building occupancy types. Precast hollow core; this construction system is preferred it provides immediate safe working platform and excellent construction speed. Provide solid separation between parking areas and living spaces and consequently offers sound and fire protection. The application of post-tensioned two-way podium slab permits the decrease of overall thickness of the frame. This will cause the reduction of excavation because the parking is below grade. Flat soffit does not need extra fire protection provided that adequate cover for rebars and post tensioning are provided. Additionally, the flat soffit permits efficient lighting, electrical, heating, ventilation, and air conditioning. Forms can be stripped two to three days after the post tensioning application. It is proven to be cost effective. It provides large open spaces at or below grade for example parking and retail. In single family and multi-family residential structures, podium slab provides high fire rating, decline sound transmission and floor vibration. 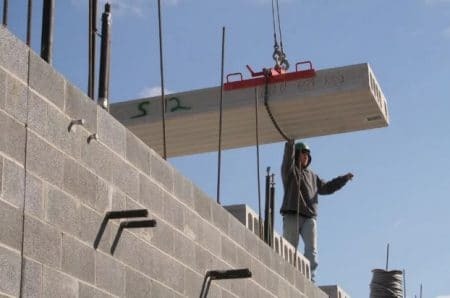 In the case of precast hollow podium slab, provision of proper connections is not easy, the unit may damage in the case of improper handling and transportation, and need special equipment and machines to move and lift precast units. In the case of post-tensions cast in place podium slab, construction work is complex, low quality workmanship could cause accidents, and there is a possibility of tendon corrosion.